Make several ants and stick them on your walls to decorate your daycare. 1. Gather your material. 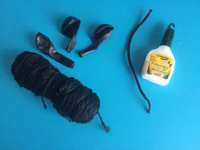 For each ant, you will need three black balloons, two wiggly eyes, a brown pipe cleaner, black yarn, scissors (not shown), and white glue. 2. Inflate the three balloons just a little. 3. 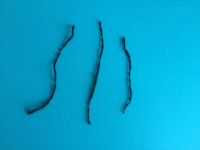 Cut three pieces of black yarn. Each one will represent two legs. 4. Tie two balloons end to end with two pieces of black yarn. Simply tie a knot in the centre of each piece of yarn and let them hang on either side of the ant's body to represent two legs on each side. 5. Pinch the tip of the centre balloon and tie it to the third balloon. Again, let the yarn hang on either side of the ant's body to represent two additional legs. 6. 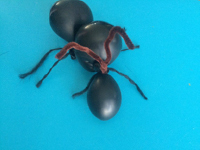 Wrap the brown pipe cleaner between the head and body and twist it into place to create your ant's antennae. 7. Add two small dots of white glue on the tip of the ant's head and press a wiggly eye on each one to complete your ant. 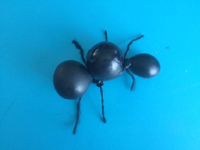 It is now ready to be hung from the ceiling or stuck on a wall as a decoration throughout your ant theme. 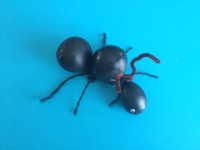 Older children will enjoy playing with their ant. 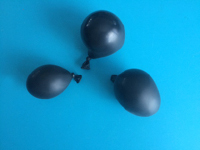 Be sure to promptly pick up any pieces if a balloon pops.